The hunt for the Higgs particle is well ahead of schedule, say researchers at the Large Hadron Collider (LHC). Earlier this year they said they would either discover the Higgs or confirm it does not exist by the end of 2012. Now, because the machine is working so well, an LHC spokesman, Professor Guido Tonelli, has told BBC News that the search could be completed much sooner. The Higgs Boson is the particle that in the physics "Standard Model" allows other particles to have mass. Discovery or elimination of the particle is one of the LHC's major objectives; and it could come as early as Christmas 2011. The Higgs particle was postulated by physicists in 1964 to explain how other sub-atomic particles have mass, and remains the only major particle in the Standard Model, the dominant current theory of sub-atomic physics, yet to be observed. The collider is a giant accelerator machine housed in a 27km-long (17 miles) circular tunnel under the French-Swiss border. Two beams of proton particles are fired around this subterranean "ring" and smashed together at crossing points. It derives from the measure of a uranium atom's nucleus - comparatively large among atoms, or as physicists joked, "as big as a barn"
Big detectors are located at these points to look for new particles in the sub-atomic wreckage of the collisions. The physicists measure the number of collisions they see in units called "inverse femtobarns", and were aiming to collect 5 inverse femtobarns' worth of data by the end of 2012. But, said Professor Tonelli who speaks for LHC's CMS experiment, the LHC has already collected 2.5 inverse femtobarns - the equivalent of 175,000 billion collisions. So in the space of a few months, the machine has collected half the data it was expected to collect in two years. The current run of collisions designed to detect the Higgs will be completed by the end of October. Professor Tonelli believes that if this rate of progress continues and nothing goes wrong, there is an outside chance of gathering sufficient data by then and analysing it fairly quickly. "What this means is that by the end of this year, not next year, we will definitely know whether or not the Higgs Boson as predicted by the Standard model exists." But although the discovery of the Higgs by Christmas is possible, it is by no means assured. Five inverse femtobarns of data may not be enough to make a definitive statement on the Higgs, according to Richard Hawkings, who speaks for the LHC's Atlas experiment. "It's a bit optimistic. If the Higgs had been in an easy to find area then yes, we may have been able to have discovered it by Christmas," he said. "But what we have discovered in the past couple of months is that its in a region that's much harder to find. This will require more data and more time." Even so, if nothing goes wrong with the supercollider, researchers will have collected the 10 inverse femtobarns of data they need to make a cast iron statement about the existence of the Standard Model version of the Higgs by next summer. 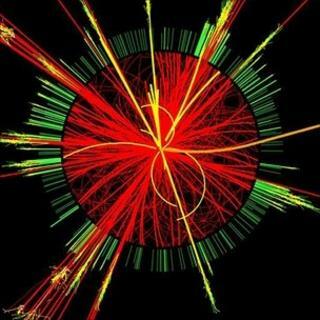 If they do discover the Higgs, it would be a triumph for the Standard Model, making it a complete theory. If they do not, it would be an even more exciting outcome, according to Professor Tonelli. "This would be the first time that we would have scientific evidence that this theory which has been so successful in the last 40 years must be definitely abandoned and we should look for another theory."